Victoria First Aid offers trainees an assortment of first aid training classes at the most affordable rates in Victoria, B.C.. Getting certified with St Mark James is as simple as completing a training course. Registration is remarkable easy with on-line, phone and email registration available. Trainees who are able to complete a course are awarded a St Mark James training certificate for first aid, cardiopulmonary resuscitation (CPR), and automated external defibrillation (AED). Several different level’s of first aid are available including occupational, standard, emergency and childcare. Courses take either one day or two days to complete and are offered in a conveniently located and comfortable training centre. Rates are amazingly low and no other training service provider offers better deals than Victoria First Aid. Registration for first aid training classes in Victoria can be completed using the registration form on the bottom of the page. The following is contact information for this St Mark James training provider in Victoria, B.C. 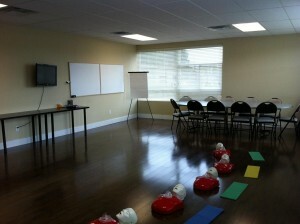 First aid classes are focused on knowledge and skill building for different injuries due to emergency situations. Simple home accidents can easily be patched up with first aid, as well as life-or-death situations needing emergency first aid action. Stand-alone classes for either CPR/AED or first aid are offered to trainees who do not want to undergo the entire training course. Big groups of trainees or companies can choose to enrol in private classes for a separate training schedule. Previous certificate must still be current. Expired awards are not eligible for re-certification. Previous certificate must be obtained through a credible provider. Certificates awarded through on-line courses are not eligible for re-certificaiton. View the list below to see the most popular credible provider. If you do not meet these prerequisites you are not eligible for re-certification. To book a re-cert course use the contact information posted above. Yes, private courses are available. To book a private workplace safety, food safe level 1, first aid and / or CPR course with Victoria First Aid use the contact information posted above. Private programs can be held at the training centre or a trained and qualified instructor can come to you. Courses are offered at the cheapest rates in the area, with enrolment fees inclusive of taxes, certificates, and St Mark James registration fees. Training manuals and equipment are also included so trainees don’t need to worry about additional expenses during the training period. If a trainee is unable to finish a training course, he or she is entitled to a full refund, provided a 72-hour notice is given prior to dropping out. Certification through St Mark James is received after a trainee finishes a training courses. The certificate is valid for three years throughout Canada and will surely meet any requirements for school or work that the trainee might need. All courses are taught by St Mark James certified instructors, in spacious and well-maintained classrooms. Trainees receive the best training with the latest technology in first aid, CPR, and AED training. The training centres are easily accessible, within walking distance to public transportation and private parking. Enrol in a first aid and CPR course in Victoria today to learn about various medical conditions, injuries and wounds.